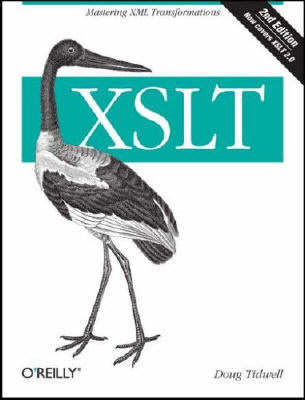 Doug Tidwell, "XSLT, 2nd Edition [ILLUSTRATED]"
After years of anticipation and delay, the W3C finally released the XSLT 2.0 standard in January 2007. The revised edition of this classic book offers practical, real-world examples that demonstrate how you can apply XSLT stylesheets to XML data using either the new specification, or the older XSLT 1.0 standard. XSLT is a critical language for converting XML documents into other formats, such as HTML code or a PDF file. With XSLT, you get a thorough understanding of XSLT and XPath and their relationship to other web standards, along with recommendations for a honed toolkit in an open platform-neutral, standards-based environment. This book: Covers the XSLT basics, including simple stylesheets and methods for setting up transformation engines Walks you through the many parts of XSLT, particularly XSLT's template-based approach to transformations Applies both XSLT 1.0 and 2.0 solutions to the same problems, helping you decide which version of XSLT is more appropriate for your project Includes profuse examples that complement both the tutorial and the reference material.